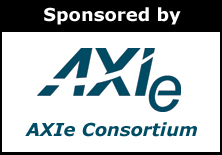 Welcome to the June 2014 issue of the AXIe Newsletter. We have two articles in this issue as well as highlighting some new AXIe products from our members. Our AXIe Consortium LinkedIn membership numbers continue to increase and we are now a community of over 325 members. While modular standards like VXI (and more recently, PXI) have been addressing service applications in aerospace and defense for over 20 years, AXIe has been gaining traction at the other end of the lifecycle in system design. A specific application is radar and antenna development and test. The enablers for this application are high-performance AXIe data converters (digitizers and arbitrary waveform generators) coupled with FPGA-based algorithms and DSP (digital signal processing software). Since beamforming, whether for radar or communications, relies on multi-element antennas, the multi-channel aspect of the application makes it well suited for modular systems. What AXIe brings to the table is a high-performance architecture that enables coherent sampling of extremely fast digitizers and AWGs within a very compact footprint. AXIe digitizers from Agilent and Guzik provide precision signal capture from 12 bits at 1.6GS/s up to 8 bits at 40 GS/s, with various rates and channel densities in between. Both companies include FPGA-based signal processing, such as DDC (digital down-conversion) with their digitizers. This may substitute for, or work complementary with, other down-converters to bring the signal of interest into the bandwidth of the digitizer. Agilent’s recently announced reference solution for multi-channel antenna calibration adds PXI-based down-converters and attenuators to condition the signal before being digitized at 3.2GS/s on each channel. This example also shows the compatibility between AXIe and PXI to deliver a total solution. You can accelerate research and development and design verification test of DOCSIS 3.1 designs with a cost-effective, AXIe-based measurement solution that provides high speed, wide bandwidth, deep memory and flexibility. The latest version, DOCSIS 3.1, of the Data Over Cable Service Interface Specification (DOCSIS) standard, has now been officially released. Designing DOCSIS 3.1-based transmitters, receivers and components, and verifying their performance against the new standard requires stringent testing - a pro­cess made more complex by the standard’s adoption of new technologies and the need for backward compatibility with previous DOCSIS versions. This document describes an AXIe test solution to meet the new requirements set forth in the DOCSIS 3.1 specification. Over the years, the DOCSIS standard evolved to meet the needs of cable operators and their subscribers. Emerging applications like HDTV video streaming around the home and in-room gaming are driving demand for multi-gigabit data rates. The need for increased bandwidth led to the latest standard revision - DOCSIS 3.1.